With the sleek, classic lines of a Patek Phillipe timepiece, the Moto 360 smartwatch looks more like the perfect complement to Savile Row’s finest apparel than the piece of wearable tech that it really is. Although there are a few exceptions, the problem with smartwatches (Galaxy Gear, we’re looking at you) is that they’re too busy being high tech gadgets to be successful at being stylish fashion accessories. Not so with Motorola’s Moto 360 smartwatch, which could very well be the flagship device of Google’s new Android Wear OS. With the sleek, classic lines of a Patek Phillipe timepiece, the Moto 360 looks more like the perfect complement to Savile Row’s finest apparel than the piece of wearable tech that it really is. Although official details about the smartwatch are scant and probably won’t be revealed until Google’s I/O event in June, the Moto 360 is rumoured to be water-resistant and lacking a camera (not like that’s a minus since you probably don’t want to be caught in all the creepiness of taking pictures from your wrist anyway). It is also expected that the gizmo will take voice commands like its Moto X sibling. 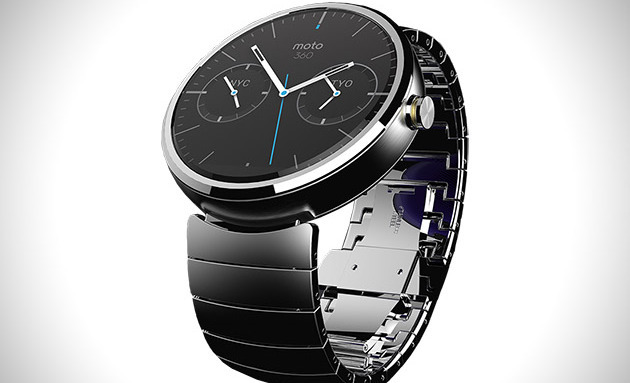 Curiously, the Moto 360 doesn’t have a microUSB port, leading one to wonder how it will be charged. Lead designer Jim Wicks officially introduces the exciting device in the video below.